Light is brightness that comes from an object such as the sun, a fire, a flashlight, or a lamp. We see light as color and brightness. Light is actually electromagnetic radiation.Light is part of the electromagnetic spectrum, which ranges from radio waves to gamma rays. Electromagnetic radiation waves, as their names suggest are fluctuations of electric and magnetic fields, which can transport energy from one location to another. 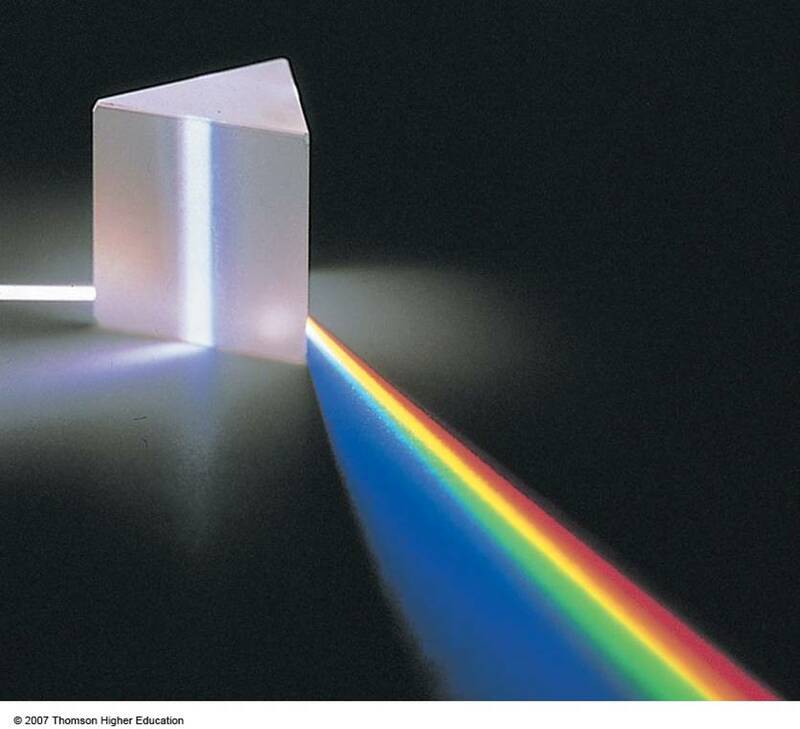 Visible light is not inherently different from the other parts of the electromagnetic spectrum with the exception that the human eye has evolved to detect visible waves. Electromagnetic radiation can also be described in terms of a stream of photons which are massless particles each travelling with wavelike properties at the speed of light. A photon is the smallest quantity (quantum) of energy which can be transported and it was the realization that light travelled in discrete quanta that was the origins of Quantum Theory. It was not by accident that humans evolved to ‘see’ light. The detection of light is a very powerful tool for probing the universe around us. As light interacts with matter it can be become altered and by studying light that has originated or interacted with matter, many of the properties of that matter can be determined. It is through the study of light that for example we can understand the composition of the stars light years away or watch the processes that occur in the living cell as they happen. 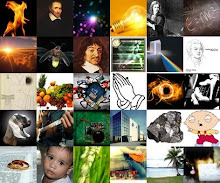 Matter is composed of atoms, ions or molecules and it is light’s interaction with matter which gives rise to the various phenomena which can help us understand the nature of matter. The atoms, ions or molecules have defined energy levels usually associated with energy levels that electrons in the matter can hold. Light can be generated by the matter or a photon of light can interact with the energy levels in a number of ways. Visible light has a wavelength in a range from about 380 or 400 nanometres to about 760 or 780 nm, with a frequency range of about 405 THz to 790 THz. In physics, the term light often comprises the adjacent radiation regions of infrared (at lower frequencies) and ultraviolet (at higher), not visible to the human eye. Properties of light includes intensity, propagation direction, frequency or wavelength, polarization, and phase. One of the fundamental constants of nature is the speed of light, about 300,000,000 meters per second or 300,000 kilometers per second in vacuum. The speed of light in a vacuum is not exactly 300,000,000 meters per second but 299,792,458 meters per second.The fixed value of the speed of light in SI units results from the fact that the meter is now defined in terms of the speed of light. Different physicists have attempted to measure the speed of light throughout history. Galileo attempted to measure the speed of light in the seventeenth century. An early experiment to measure the speed of light was conducted by Ole Romer, a Danish physicist, in 1676. Using a telescope, Ole observed the motions of Jupiter and one of its moons, Io. Noting discrepancies in the apparent period of Io's orbit, Romer calculated that light takes about 22 minutes to traverse the diameter of Earth's orbit.Unfortunately, its size was not known at that time. If Ole had known the diameter of the Earth's orbit, he would have calculated a speed of 227,000,000 meters per second. Another, more accurate, measurement of the speed of light was performed in Europe by Hippolyte Fizeau in 1849. Fizeau directed a beam of light at a mirror several kilometers away. A rotating cog wheel was placed in the path of the light beam as it traveled from the source, to the mirror and then returned to its origin. Fizeau found that at a certain rate of rotation, the beam would pass through one gap in the wheel on the way out and the next gap on the way back. Knowing the distance to the mirror, the number of teeth on the wheel, and the rate of rotation, Fizeau was able to calculate the speed of light as 313,000,000 meters per second. Leon Foucault used an experiment which used rotating mirrors to obtain a value of 298,000,000 meters per second in 1862. Albert A. Michelson conducted experiments on the speed of light from 1877 until his death in 1931. He refined Foucault's methods in 1926 using improved rotating mirrors to measure the time it took light to make a round trip from Mt. Wilson to Mt. San Antonio in California. The precise measurements yielded a speed of 299,796,000 meters per second. Two independent teams of physicists were able to bring light to a complete standstill by passing it through a Bose-Einstein Condensate of the element rubidium, one team led by Dr. Lene Vestergaard Hau of Harvard University and the Rowland Institute for Science in Cambridge, Mass., and the other by Dr. Ronald L. Walsworth and Dr. Mikhail D. Lukin of the Harvard-Smithsonian Center for Astrophysics, also in Cambridge. There are many sources of light. The most common light sources are thermal: a body at a given temperature emits a characteristic spectrum of black-body radiation. Examples include sunlight, light bulbs, and fire.The peak of the blackbody spectrum is in the infrared for relatively cool objects like human beings. As the temperature increases, the peak shifts to shorter wavelengths, producing first a red glow, then a white one, and finally a blue color as the peak moves out of the visible part of the spectrum and into the ultraviolet. These colors can be seen when metal is heated to "red hot" or "white hot". Blue thermal emission is not often seen. The commonly seen blue colour in a gas flame or a welder's torch is in fact due to molecular emission, notably by CH radicals (emitting a wavelength band around 425 nm). Certain chemicals produce visible radiation by chemoluminescence. In living things, this process is called bioluminescence. 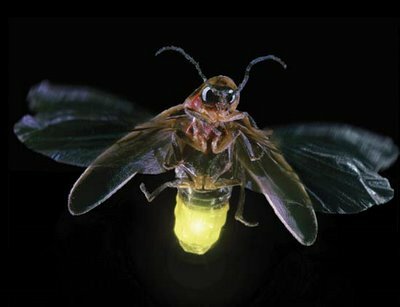 For example, fireflies produce light by this means, and boats moving through water can disturb plankton which produce a glowing wake. Certain substances produce light when they are illuminated by more energetic radiation, a process known as fluorescence. Some substances emit light slowly after excitation by more energetic radiation. This is known as phosphorescence. Mechanism such as scintillation, electroluminescence, sonoluminescence, triboluminescence, and Cherenkov radiation produces light. 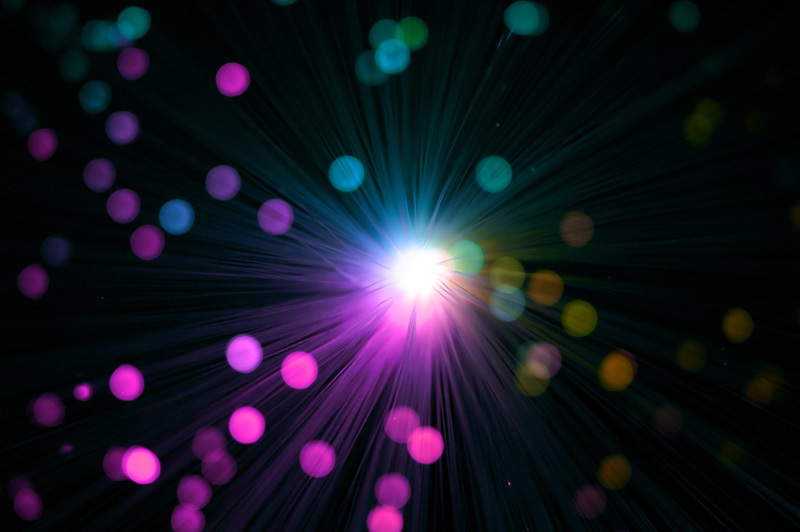 Radioactive decay and Particle-antiparticle annihilation mechanisms are included when the concept of light is intended to include very-high-energy photons. Light waves have wavelengths between about 400 and 700 nanometers (4,000 and 7,000 Å). Our eyes perceive different wavelengths of light as the rainbow hues of colors. Red light has relatively long waves, around 700 nm (10-9 meters) long. Blue and purple light have short waves, around 400 nm. Shorter waves vibrate at higher frequencies and have higher energies. Red light has a frequency around 430 terahertz, while blue's fequency is closer to 750 terahertz. Red photons carry about 1.8 electron volts (eV) of energy, while each blue photon transmits about 3.1 eV. Visible light's neighbors on the EM spectrum are infrared radiation on the one side and ultraviolet radiation on the other. Infrared radiation has longer wavelength waves than red light, and thus oscillates at a lower frequency and carries less energy. Ultraviolet radiation has waves with shorter wavelengths than do blue or violet light, and thus oscillates more rapidly and carries more energy per photon than visible light does. When light reflects off a surface, it follows some rather basic rules which have been gradually determined by observation. Consider the animation to the left. A ray of light approaches a reflecting horizontal surface at an angle of 45°, bounces from the surface, and leaves at an angle of 45°. Light approaching a surface is known as incident light. This is the incoming light before it has reached the surface. After light has struck a surface and bounced off, it is known as reflected light. This is the light that is now departing from the surface. The angle at which a ray of light approaches a surface, reflective or not, is called the angle of incidence. It is measured from an imaginary line perpendicular to the plane of the surface in question to the incoming ray of light. Once the light has reflected from a reflective surface, the angle at which the light departs from the surface is called the angle of reflection. This angle is also measured from a perpendicular to the reflecting surface to the departing ray of light. When light reflects from a surface, the angle of reflection is always equal to the angle of incidence. When multiple rays of light approach a reflecting surface, each individual ray behaves independently of all the others. Thus, in the figure to the , each of the three incident rays depicted has its own individual angle of incidence, and each reflected ray has its corresponding angle of reflection. If all three angles of incidence are the same and the surface of reflection is perfectly flat as shown, all three angles of reflection will also be the same. When the surface is irregular instead of flat, each ray of light still has its angle of incidence and its angle of reflection. However, the angle is measured at the point at which the light strikes the surface. Thus, as shown to the right, light striking an irregular surface gets scattered in all directions upon reflection. This is the case with ordinary walls and surfaces. Actually, this is all to the good, because it is this scattered reflected light by which we can see such walls and surfaces. Refraction is the name given to the observed phenomenon that light changes direction, or "bends," as it passes the boundary between one medium and another. This is shown to the right, in a general sense. Here, we see a beam of light traveling through air, until it meets a pool of water. It arrives at some angle to the surface as shown. As it passes through the boundary, going from air into water, it actually slows down. Since even a single ray of light has a finite thickness, the part that enters the water first slows down first, causing the light ray to change direction to a steeper angle in the water. If we change the angle at which the light enters the water, we find that the angle of the light in the water also changes, such that we see no change at all if the light source is directly overhead so that the entering ray of light is perpendicular to (in mathematical terms normal to) the surface. As we change the entering angle more and more away from the perpendicular, we see that the ray of light in the water has bent more and more away from the direction taken by that ray of light in the air. Light is measured with two main alternative sets of units: radiometry consists of measurements of light power at all wavelengths, while photometry measures light with wavelength weighted with respect to a standardized model of human brightness perception. Photometry is useful, for example, to quantify Illumination (lighting) intended for human use. 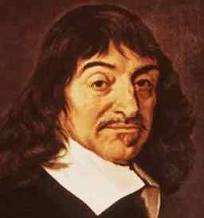 René Descartes (1596–1650) held that light was a mechanical property of the luminous body, rejecting the "forms" of Ibn al-Haytham and Witelo as well as the "species" of Bacon, Grosseteste, and Kepler.In 1637 he published a theory of the refraction of light that assumed, incorrectly, that light travelled faster in a denser medium than in a less dense medium. Descartes arrived at this conclusion by analogy with the behaviour of sound waves.Although Descartes was incorrect about the relative speeds, he was correct in assuming that light behaved like a wave and in concluding that refraction could be explained by the speed of light in different media. Newton's theory could be used to predict the reflection of light, but could only explain refraction by incorrectly assuming that light accelerated upon entering a denser medium because the gravitational pull was greater. 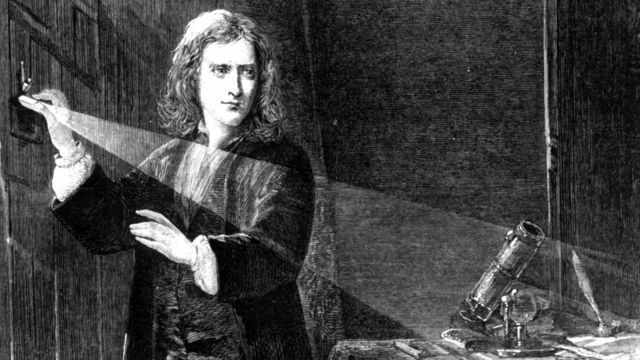 Newton published the final version of his theory in his Opticks of 1704. His reputation helped the particle theory of light to hold sway during the 18th century. The particle theory of light led Laplace to argue that a body could be so massive that light could not escape from it. In other words it would become what is now called a black hole. Laplace withdrew his suggestion when the wave theory of light was firmly established. A translation of his essay appears in The large scale structure of space-time, by Stephen Hawking and George F. R. Ellis. 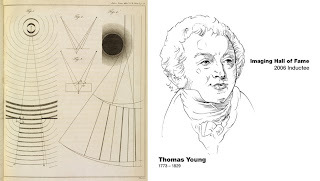 The wave theory predicted that light waves could interfere with each other like sound waves (as noted around 1800 by Thomas Young), and that light could be polarized, if it were a transverse wave. Young showed by means of a diffraction experiment that light behaved as waves. 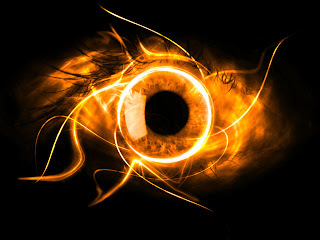 He also proposed that different colors were caused by different wavelengths of light, and explained color vision in terms of three-colored receptors in the eye. Later, Augustin-Jean Fresnel independently worked out his own wave theory of light, and presented it to the Académie des Sciences in 1817. 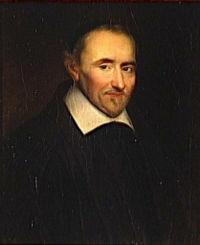 Simeon Denis Poisson added to Fresnel's mathematical work to produce a convincing argument in favour of the wave theory, helping to overturn Newton's corpuscular theory. 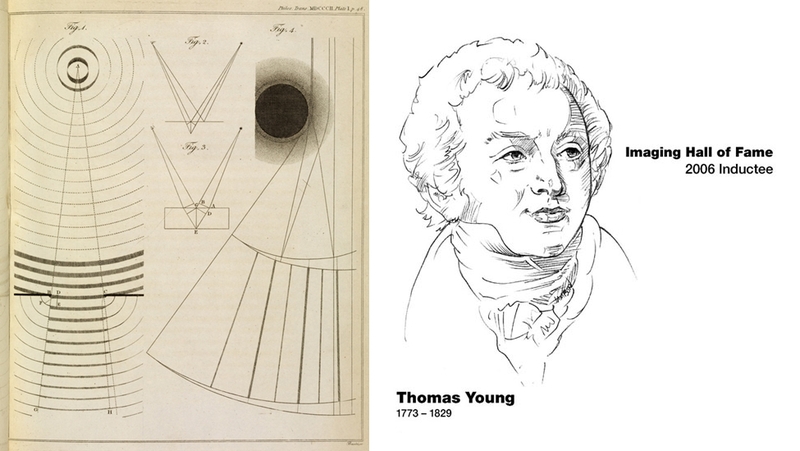 By the year 1821, Fresnel was able to show via mathematical methods that polarization could be explained only by the wave theory of light and only if light was entirely transverse, with no longitudinal vibration whatsoever. The weakness of the wave theory was that light waves, like sound waves, would need a medium for transmission. A hypothetical substance called theluminiferous aether was proposed, but its existence was cast into strong doubt in the late nineteenth century by the Michelson-Morley experiment. In 1845, Michael Faraday discovered that the plane of polarization of linearly polarized light is rotated when the light rays travel along the magnetic field direction in the presence of a transparent dielectric, an effect now known as Faraday rotation. This was the first evidence that light was related to electromagnetism. In 1846 he speculated that light might be some form of disturbance propagating along magnetic field lines. Faraday proposed in 1847 that light was a high-frequency electromagnetic vibration, which could propagate even in the absence of a medium such as the ether. Faraday's work inspired James Clerk Maxwell to study electromagnetic radiation and light. Maxwell discovered that self-propagating electromagnetic waves would travel through space at a constant speed, which happened to be equal to the previously measured speed of light. From this, Maxwell concluded that light was a form of electromagnetic radiation: he first stated this result in 1862 inOn Physical Lines of Force. In 1873, he published A Treatise on Electricity and Magnetism, which contained a full mathematical description of the behaviour of electric and magnetic fields, still known as Maxwell's equations. Soon after, Heinrich Hertz confirmed Maxwell's theory experimentally by generating and detecting radio waves in the laboratory, and demonstrating that these waves behaved exactly like visible light, exhibiting properties such as reflection, refraction, diffraction, and interference. Maxwell's theory and Hertz's experiments led directly to the development of modern radio, radar, television, electromagnetic imaging, and wireless communications. where E is energy, m is, depending on the context, the rest mass or the relativistic mass, and c is the speed of light in a vacuum. The modern theory that explains the nature of light includes the notion of wave–particle duality, described by Albert Einstein in the early 1900s, based on his study of the photoelectric effect and Planck's results. 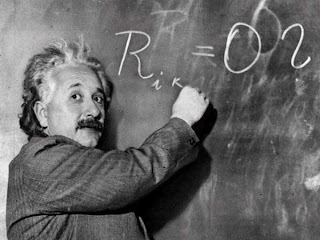 Einstein asserted that the energy of a photon is proportional to its frequency. More generally, the theory states that everything has both a particle nature and a wave nature, and various experiments can be done to bring out one or the other. 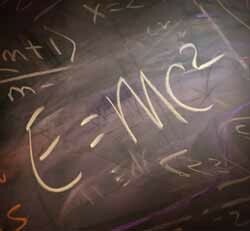 The particle nature is more easily discerned if an object has a large mass, and it was not until a bold proposition by Louis de Broglie in 1924 that the scientific community realized that electrons also exhibited wave–particle duality. The wave nature of electrons was experimentally demonstrated by Davisson and Germer in 1927. Einstein received the Nobel Prize in 1921 for his work with the wave–particle duality on photons (especially explaining the photoelectric effect thereby), and de Broglie followed in 1929 for his extension to other particles.